Can Leo belong to two families? Two completely different worlds? Wow! Loved, loved, loved this children’s picture book! It’s original and fresh while clearly illustrating how Leo can be loved by two entirely different families. As the mom of an autistic young lady, I’m really touched by the scenes where Leo finds there are things about him that are different and outsiders reject, but that his families accept with unconditional love. And I absolutely adore that both families love Leo and want what makes Leo happiest. The story is short and sweet, the illustrations whimsical and so deeply evocative that there’s almost no need for the sparse narration. Leo and his parents are caught in a storm while boating on the ocean and Leo is lost overboard. A family of seals rescues Leo and raises him to live in the ocean. 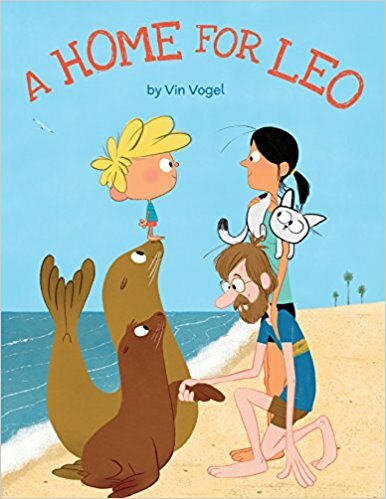 When Leo is returned to his human family, he finds things are very different from his ocean family. HE feels so different. Can Leo find a way to belong? A Home for Leo seems so simple on the surface, but it raises many questions about families, belonging, and the love that binds us. I think I’ll be sharing this message soon with some little ones and a few who are not so little, but who often feel as if they don’t quite belong. Highly recommended! A Home for Leo displayed beautifully on a Fire tablet, Kindle for iPad, and Kindle for iPhone.